The recall, which affects both 2012 and 2013 iQ microcars, was issued due to faulty sensor cables. Toyota announced on Wednesday that it is voluntarily recalling select model-year 2012 and 2013 Scion iQ microcars due to an air bag problem. Specifically, affected airbags may inadvertently inflate or not inflate at all, because of damaged data cables. Said data cables, also known as sensor cables, may become damaged if a loose object were to fall beneath the vehicle’s seat, where the cable is located. Additionally, the seatbelt pre-tensioners may also fail to operate properly, according to the recall notice. The safety recall involves about 11,200 iQ vehicles. Toyota has not divulged a specific recall notice schedule, but did state that it will begin inspecting Scion iQ microcars in December. Dealers will outfit affected cables with protective covers, free of charge. In the meantime, owners can contact Scion at 1-866-707-2466. Despite being one of the smallest cars available, the Scion iQ manages to house 11 standard airbags. Air bag locations include driver and passenger front, driver and passenger knee, driver and passenger side, and driver and passenger curtain. The iQ also features an innovative rear curtain air bag, which protect backseat passengers’ heads from rear end collisions. As for safety ratings, the iQ earned a four-star crash test rating from the National Highway Traffic Safety Administration in overall, front and rollover testing. The iQ did, however, earn a three-star rating in side crash testing. 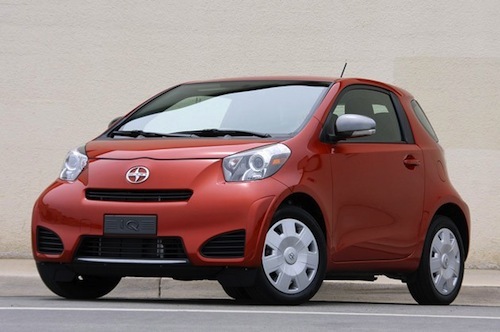 Also known as the Toyota iQ, the Scion iQ was introduced to US markets in the summer of 2011. The world smallest four-seater, the iQ boasts an impressive 37 combined MPG, making it the most fuel efficient car under $20,000. The iQ has won several awards since its release including IntelliChoice’s “Best Overall Value of the Year Award.” The automotive research site praised the microcar for its unique seating, 11 airbags, technological capability, and its numerous standard features like vehicle stability control, Smart Top Technology brake override, electronic brake force distribution, and traction control. Aside from receiving numerous awards, the iQ made headlines earlier this year for its controversial "Babes n' Donuts" ad campaign. The commercial, which featured several scantily clad women driving in an iQ while drinking milk, was pulled just a week after its release due to the negative press it garnered. That being said, the ad is currently available to watch on YouTube.